Propertyhawk lauched the Rent Index last week. The Rent Index is the first index of the UK residential private sector rents. An interesting tool for anyone engaged in the UK residential sector. 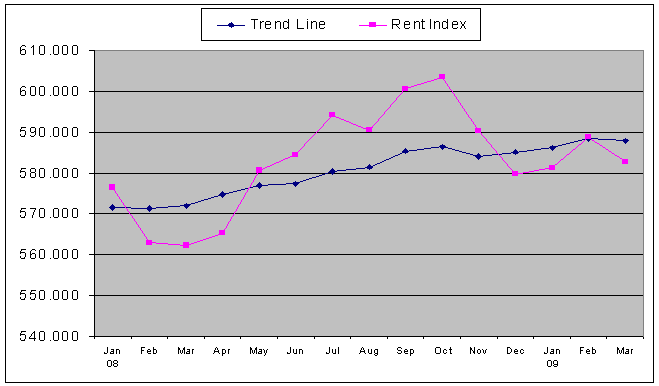 The index now stands at GBP 582.777, meaning the average monthly rent in England and Wales equals GBP 582 this month. The index is down 2,7% over the last 6 months and up 3,5% over the last 12 months. This may sound a bit odd. However, it seems that the index has been quite volatile over the last year. Year high was around 603 (Oct), whereas last year’s low was around 562. We have been aware for some time that unlike house prices there was a definite shortage of information on residential rents. When trying to find out what the average rent was, nobody seemed to know. We wanted to provide a single figure for UK private sector rents that would tell people at a glance what the average rent was and whether rents were going up or down. The Rent Index gives a dynamic snapshop of average rents in the private residential sector. It is re-calculated daily, plotting the average rent over a rolling 90 day period. It covers a thorough cross section of rental property covering England and Wales. It uses actual tenancy data from thousands of private residential landlords. The data has been captured from thousands of UK landlords using Assured Shorthold Tenancy agreements used to create their tenancies. I would be interested to learn about comparable initiatives in other countries. Demand for rental property is strong by historic standards, particularly at lower price points. However, supply has increased by more than half over the past year, mainly as a result of developers and other frustrated vendors opting to put their properties on the rental market. It is this increased choice that is pushing down rents. Previous Bull bias or start of upswing? It is Spring after all!